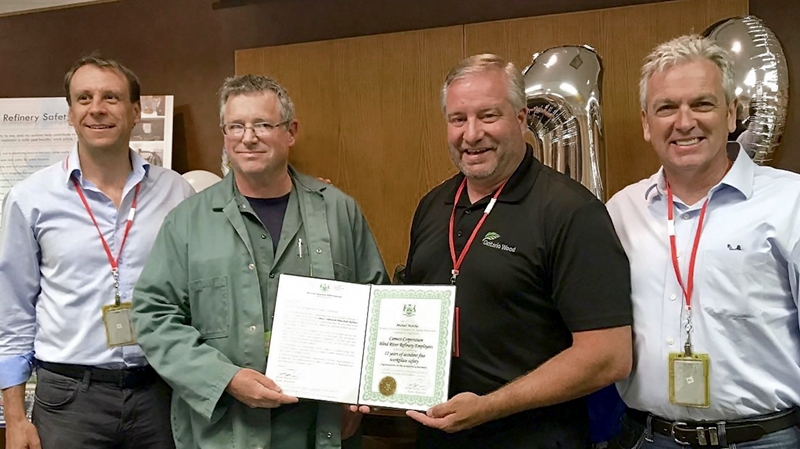 In June, 2018 our Blind River Refinery celebrated the remarkable achievement of operating 12 full years without a lost-time injury. In this industrial facility, our team places safety at the center of everything they do and it shows. Since 1990, Blind River has received Cameco's top award for safety performance, the Mary-Jean Mitchell Green Award, more times than any other Cameco facility. The Blind River refinery has an excellent safety record. The operation has systematic programs to identify, document and address risks and engage all workers and managers in development of a strong safety culture. These programs meet the international OHSAS 18001 and have delivered excellent safety performance. Radiation risks are effectively managed at Blind River through a formal radiation protection program and dedicated personnel who ensure that workers are safe. The program ensures that radiation protection is considered in the physical design of all facilities and operating procedures. It also provides for systematic monitoring of radiation in work areas and tracking the exposures of individual workers using a combination of monitoring devices and health testing. Radiation exposures at Blind River are far below regulatory limits. Environmental protection at Blind River is assured through an ISO 14001-certified environmental management system. The system provides for systematic identification and mitigation of environmental risks and reduction and effective management of waste. Blind River has comprehensive environmental monitoring programs to ensure that emissions to air and water are kept as low as reasonably achievable and well below regulatory limits. At approximately 10:00 am EST, a semi trailer carrying uranium concentrate to Cameco’s Blind River Refinery was involved in a minor accident on Highway 17 about 110 kilometres north of Sault Ste. Marie, Ontario. There were no injuries. The exterior of the trailer was damaged but the load was not affected. Cameco ERT responded to the scene. Local police, Transport Canada’s CANUTEC and CNSC were notified. Following an inspection of the trailer at the scene, the truck continued to Blind River. The contracted transportation company is investigating to determine the cause and possible corrective actions. Includes all releases to the environment reportable to Ontario Ministry of Environment's Spills Action Centre and other significant events. Detailed plans and financial guarantees are in place to restore the Blind River site to public use once the facility reaches the end of its productive life. All new significant changes to existing operations are subject to environmental assessments to identify potential effects on the environment. The Blind River refinment facility is licensed and regulated by the Canadian Nuclear Safety Commission (CNSC). The operation is also subject to other federal and provincial regulations for the protection of people and the environment, including by Environment Canada and Ontario’s Ministry of the Environment. Federal and provincial regulators conduct regular site inspections and audits to verify that people and the environment are protected.